When we arrived to the airport, it was about 1 AM. 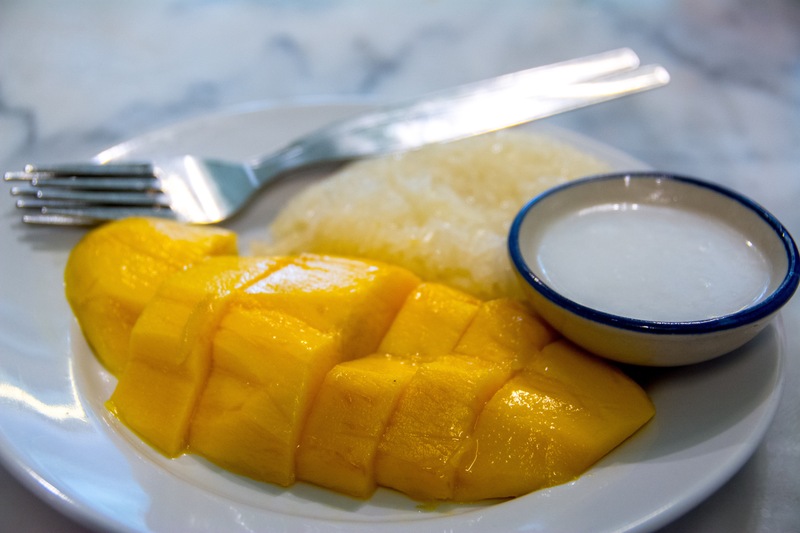 Last time I was in Bangkok the city was still bustling at this time, but we stayed on a different segment of Sukhumvit that was apparently a bit more mellow. 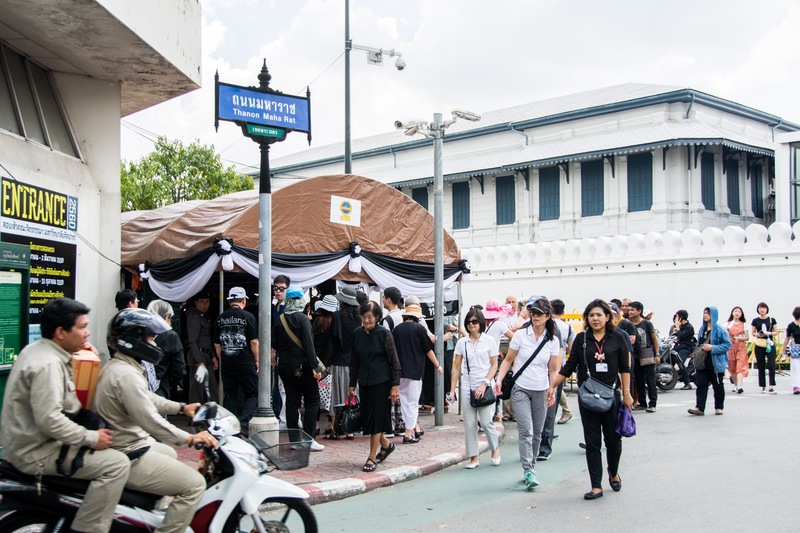 Also, affecting the vibe of the city was the death of King Bhumibol Adulyadej which occurred on October 13, 2016. King Bhumibol was the longest reigning King in Thai history and the most beloved King. In remembrance of the King, a 30 day mourning period was instituted asking people to refrain from “joyful events” and leading many to abstain from wearing bright colors and to don a black ribbon. However, a Thai woman that we know in Seoul told us that people will actually be in mourning for a whole year! Wearing only black clothing and not wearing any makeup. 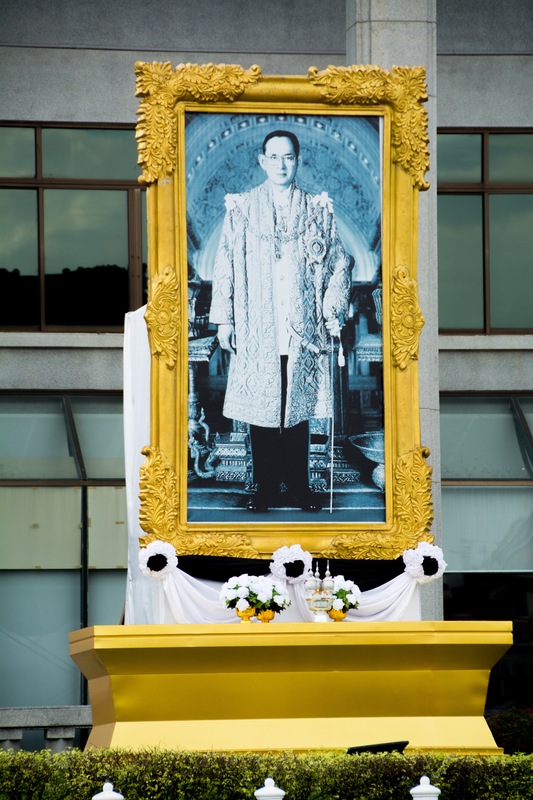 During our time in Bangkok, reminders of the King’s passing were ever present, from billboards, memorial shrines, and ribbons worn by the people, it was clear that the King was still alive in the hearts of his people. 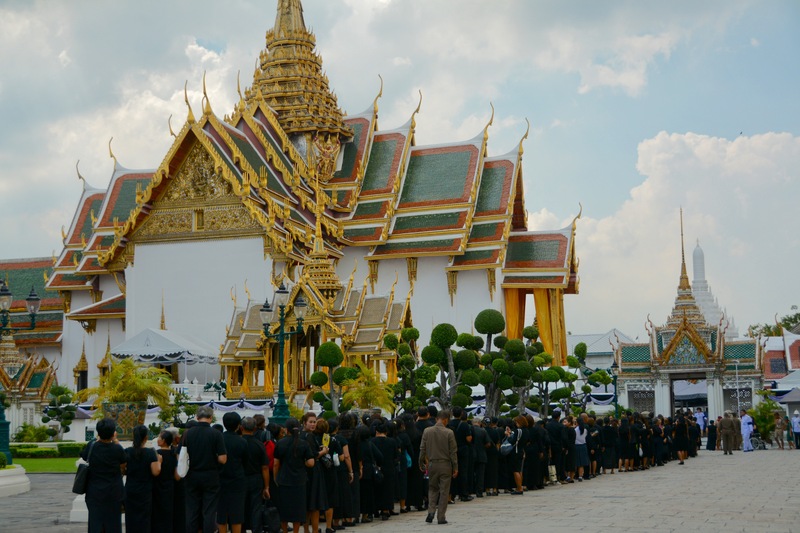 Below you will see masses of people lining up to pay their respects to the King. We were fortunate that although Thailand was mourning, all of the tourist sites were still open. We started our day by taking the Skytrain to Saphan Taksin station. 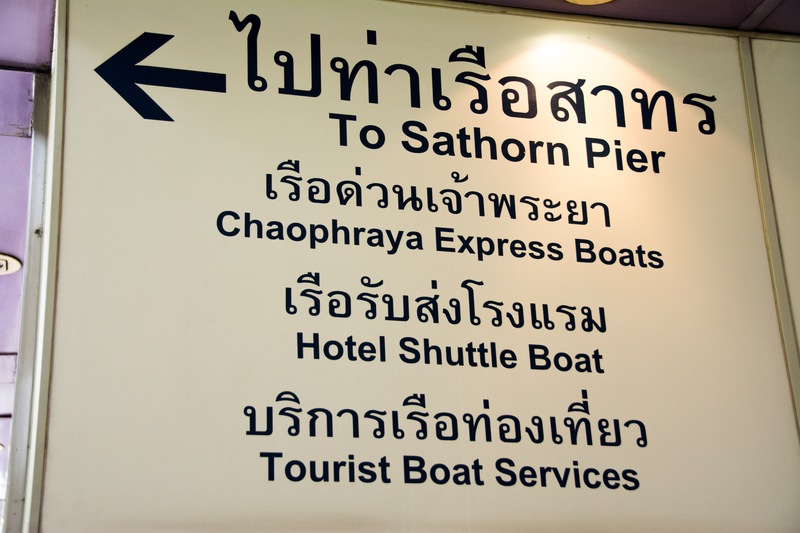 Then use Exit 2 and walk to Sathorn Pier to the Tourist Ferry. There were a lot of people at the pier waiting for the Ferry and it can definitely get crowded. The ferry has stops at many different destinations and is a pretty convenient way to travel to a lot of tourist destinations. 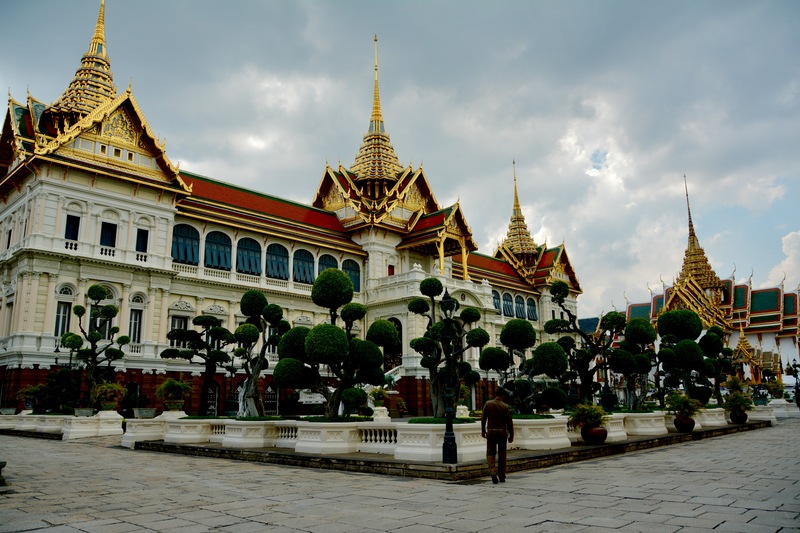 Our first stop was to see The Grand Palace, get off the Ferry at Pier 9 and then go out to the main street and make a right. You will see a security line down a little ways and that will be the entrance to the Palace. Security will ask you to show your ID (so make sure you bring it with you) and then they will check your bag. 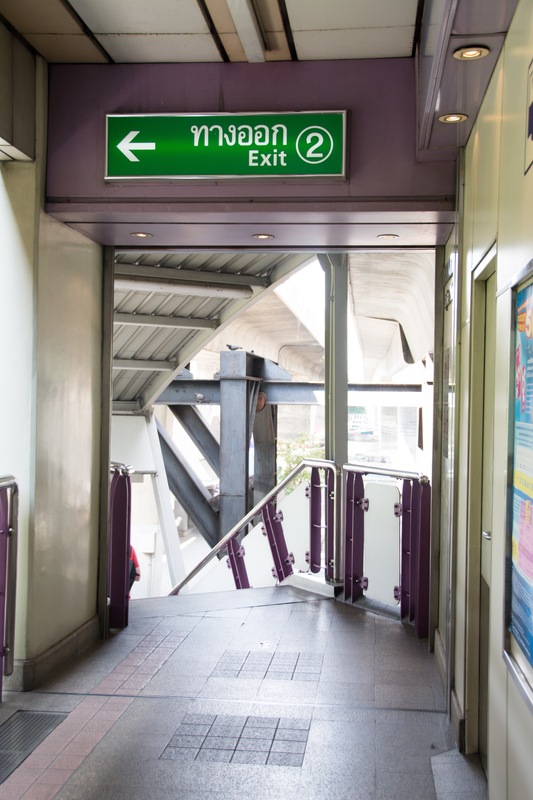 Once you get inside the entrance, if you forgot your sarong or your pants, then you will need to borrow clothes in order to make sure your shoulders and knees are covered. It is free to borrow the clothes, but they will take a 200฿ deposit per piece of clothing (make sure you have change or you’ll be leaving extra money with them). When you have finished at the Palace, you just bring your clothes and the deposit receipt back to them and you will be funded your money. Then you should head to the ticket booth to buy your entrance ticket. The palace covers 218,000 square meters and surrounded by four walls. So it is truly huge! It has been the official residence of the King, however the late King Bumibol resided elsewhere and just utilized the palace for official functions. The palace itself is very large and made up of many different buildings that are incredibly ornate. Once you get inside and hopefully away from the throngs of tour groups, you will be able to enjoy at your own pace the beautiful architecture, statues, and ornaments. We really enjoyed our time on the grounds. I thought the Demon Guardians were really interesting. 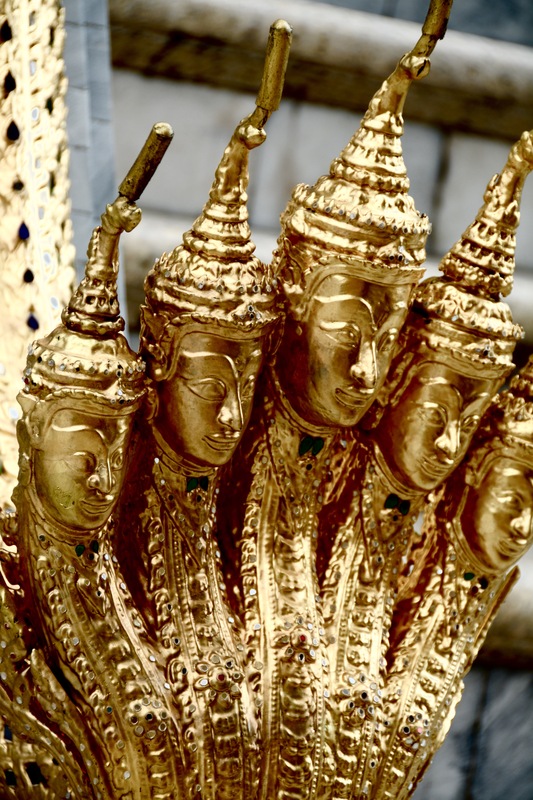 There are six pairs of them standing at the gate of the gallery; with most of them facing the Chapel of the Emerald Buddha. 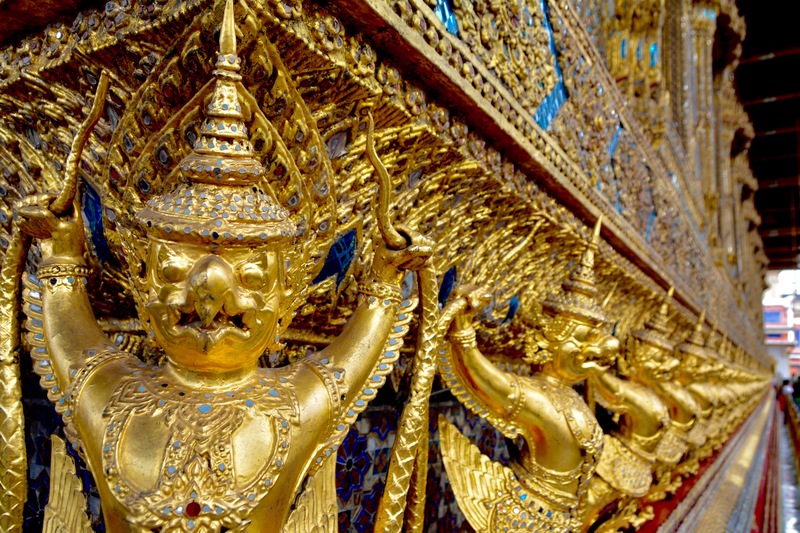 They guard the Emerald Buddha from evil spirits. 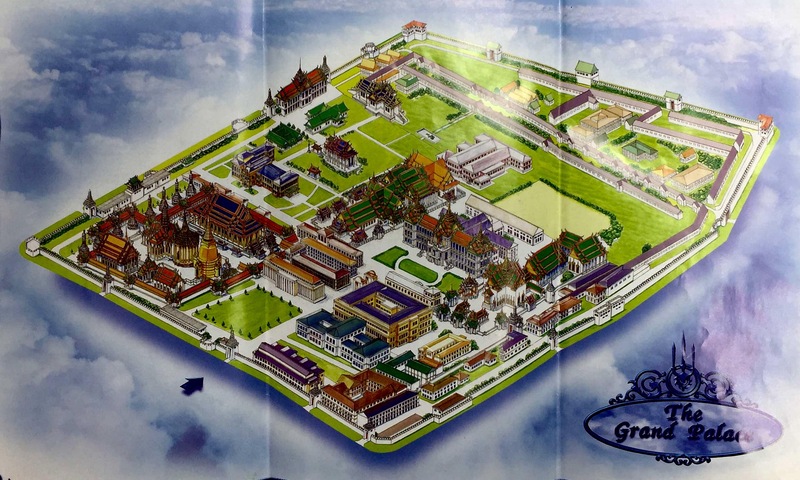 After you exit the Palace, go left and you will walk right into Wat Pho. 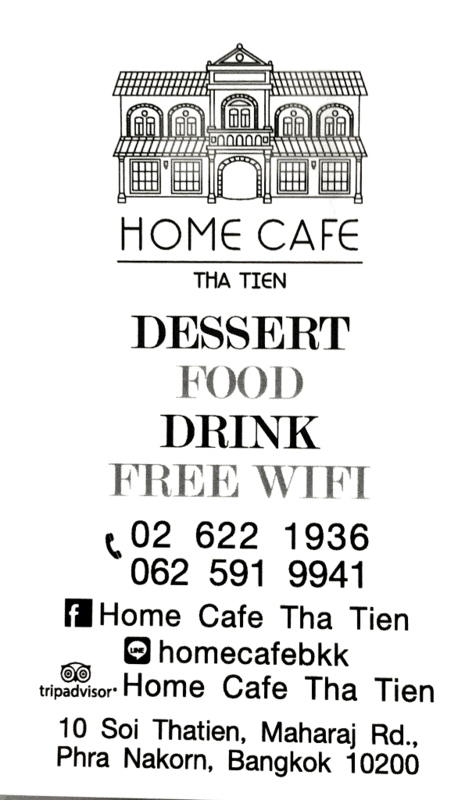 Along the way we stopped in at Home Cafe Tha Tien for a little lunch and to bask in the glory of their air conditioning! There are plenty of restaurants in the area, but we enjoyed this little restaurant. 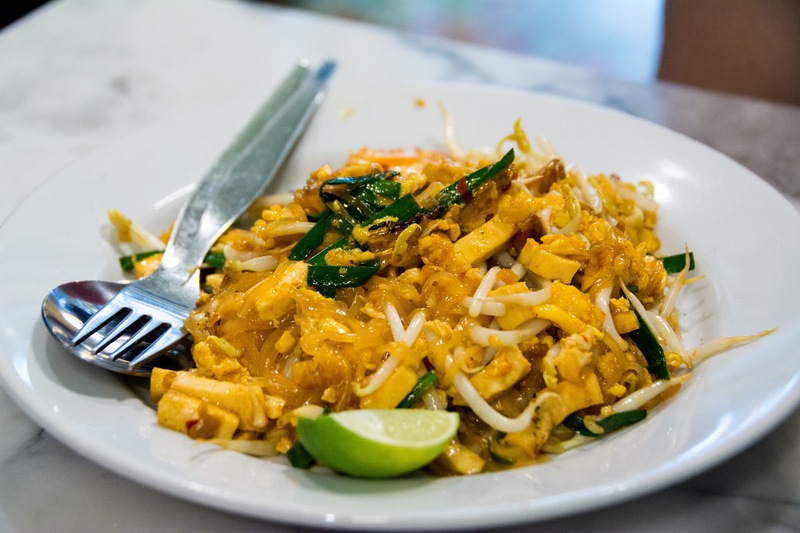 We ordered some Shrimp Pad Thai (80฿), Pork with Basil (60฿) and a Mango Sticky Rice (80฿). Everything was fresh and tasty and portions were great for the price. Right after you enter the front gate, you will see the ticket booth. Purchase your tickets and I recommend heading straight to the back area where the massage school is. 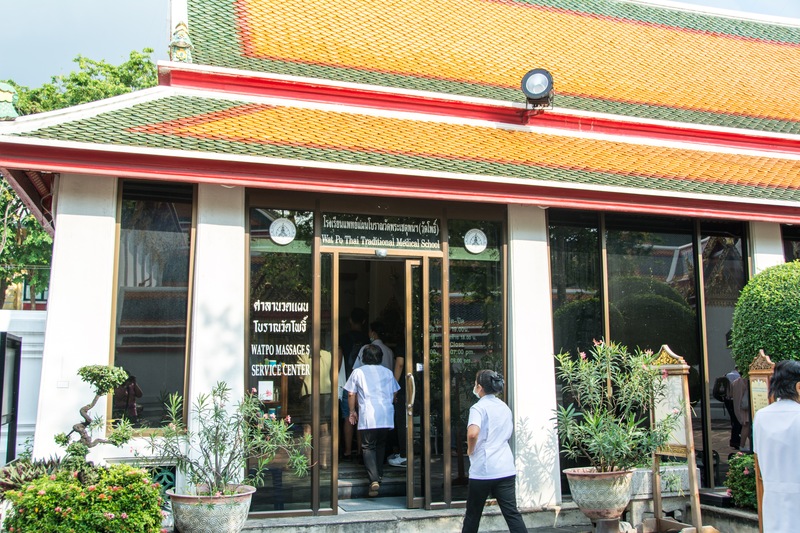 If you are a massage lover, this is a very well known place to get a traditional Thai massage and I definitely recommend getting one here. If you have never had a Thai massage, it is very different from the “relaxation” massages you get at most American spas. I like to say that Thai massages are more interactive, it almost feels like you and the masseuse are wrestling, but you don’t need to do any work. It is definitely an awesome way to loosen and stretch out any tight muscles. Since there are sometimes long waits for a massage, and I love to maximize my time, it’s best to get your name in and be able to walk around the temple while you wait. Massages are 420฿ (about $12) for an hour full body Thai massage. We were pretty lucky and only waited about 30 minutes and were able to tour around the temple for about 20 minutes before returning for our appointment. The area where the massages are given is a shared area with probably 20 beds, so don’t expect a private spa experience. The massages themselves are very good and you will feel loosey goosey after your time there. Then after our very relaxing massage we explored the rest of Wat Pho. Wat Pho aka The Temple of the Reclining Buddha is known for just that, a 15 meter high and 46 meter long gold reclining Buddha. Enjoy a walk around on your own or hire an additional guide to show you around. 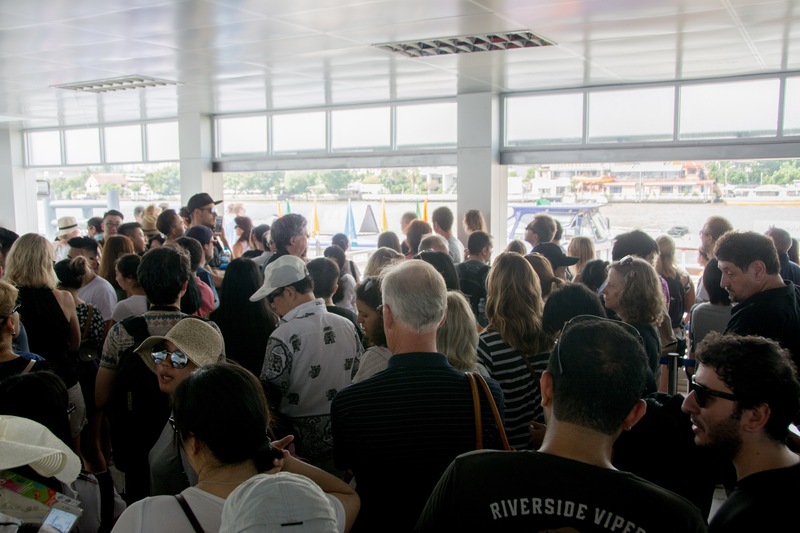 We were tired after Wat Pho and wanted to head back to our hotel to rest for a bit, however, since I refuse to be ripped off by a taxi and we couldn’t find any honest drivers to take us, we decided to get back on the ferry. However, now that we’re older and wiser, if at any time you need a cab and can’t find one on the street, just use Uber! Pricing is about the same and it’s an easy way to guarantee that won’t get ripped off. At the pier, you had to take the n8 Ferry across the river to Wat Arun before boarding a Ferry back to Sathorn Pier, so off we went. I was actually quite happy we did, as Wat Arun is absolutely gorgeous and we caught it during sunset (I’ll venture to guess that it is even more beautiful at sunrise as it is called “The Temple of the Dawn.” But I highly recommend sunset. If you don’t enter the temple you can enjoy the outside for free (which is what we did), otherwise you will need to buy a ticket. 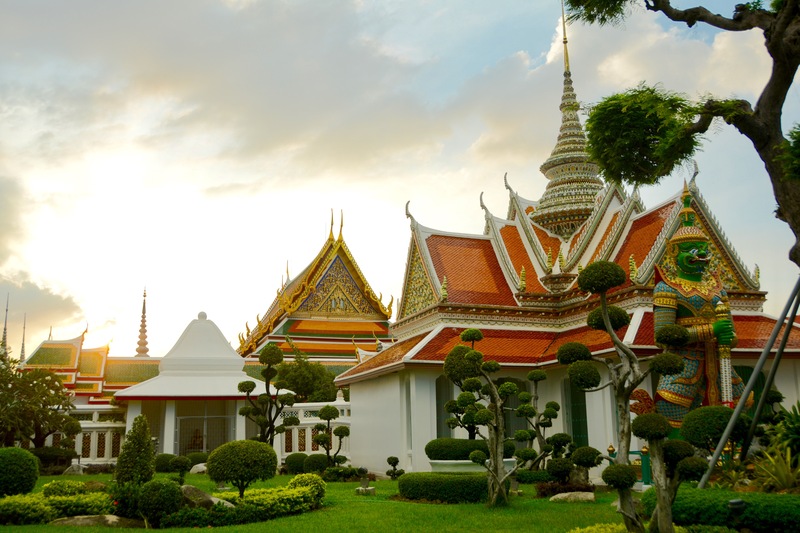 The temple has impeccable landscaping and is very tranquil (we saw people picnicking). 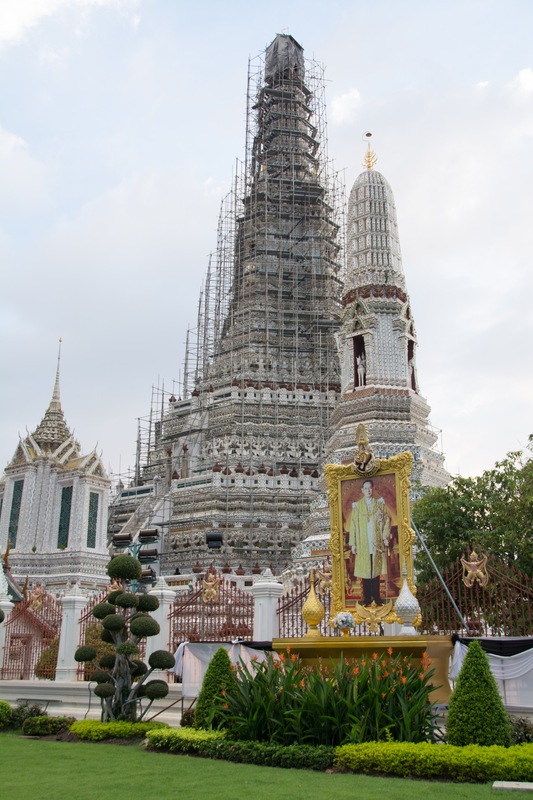 When we were there though, part of the Stupa was under renovation, it should be done soon according to the temple. If after all of your touring, you want to rest your feet and just enjoy drink, head back across the river to Eagle’s Nest. The bar boasts a nice view of the Chao Praya. It is definitely a good spot to hang out and enjoy the susnset or nighttime views. We had an amazing first day in Bangkok and were so amazed by all the beautiful architecture and delicious food. Day 2 would take us out of the city and to 2 famous markets! Since we had packed a lot into our first day, we were ready to grab some dinner and head back to the hotel for a good night’s sleep. 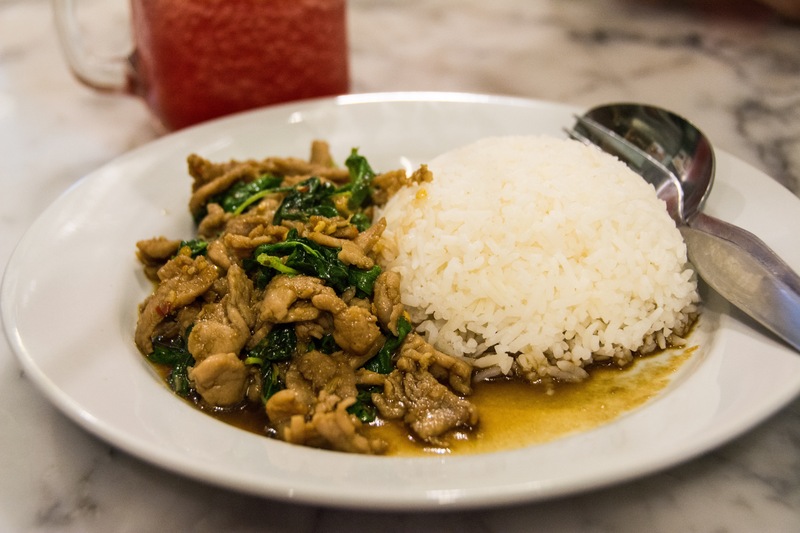 To see what we did on Day 2 of our trip to Bangkok, click here.